Prof. Rajakumar's research group focuses on understanding the elementary reactions that happen in both the Troposphere and the Stratosphere of the Earth's atmosphere on one hand and in the combustion on the otherhand. The absorption measurements of the radicals originating from the oxidation processes of volatile organic compounds via their reactions with hydroxyl radical, chlorine atoms and many such oxidizing species those are important in the Earth's atmosphere, are being pursued. Cavity Ring Down Spectroscopy (CRDS) is used as a tool for this purpose. This CRD spectrometer is completely in-built in our laboratory. The fate of long-lived intermediates such as Criegee intermediates are explored using CRDS. The kinetic parameters of radical-stable molecular, radical-radical reactions are measured in our laboratory using cross photolysis - cavity ring down spectroscopy (CP-CRDS) method. 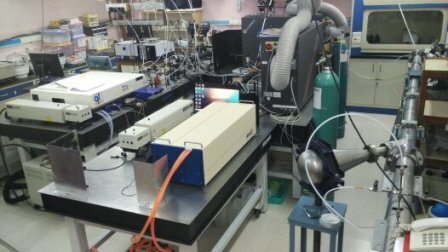 The kinetics of the reactions of VOCs, anthropogenically disposed compounds and the naturally released compounds into the Earth's atmosphere are measured using two different techniques. One method is Pulsed Laser Photolysis - Laser Induced Fluorescence (PLP-LIF) and the other one is Relative Rate (RR) method using various lasers. These measured kinetic parameters and absorption cross-sections (both in UV, Visible and IR range) are highly useful in estimating the lifetimes, global warming potentials (GWPs), Ozone Depletion Potentials (ODPs) and Ozone Formation Potentials (OFPs) of any compound of interest. The kinetics relevant to the combustion are studied in our laboratory using an in-built Single Pulse Shock Tube (SPST) facility. Ignition delay measurements and auto ignition studies are being carried out using this facility. The kinetics scheme is examined using advanced simulations. 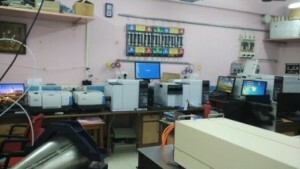 Our laboratory is built with state of the art facilities such as Infrared spectrometers with very high resolution, gas chromatographs with varieties are detectors such as TCD, FID, ECD and NPD. Additionally, GC-MS and GC-IR facilities are added recently. Quantum chemical calculations are our additional arms to complement all our measurements in our laboratory. ab-initio, DFT methods are very widely used for our calculations. The transition state theory along with variational effects in combination with various tunneling corrections are implemented to obtain highly reliable data from our laboratory.